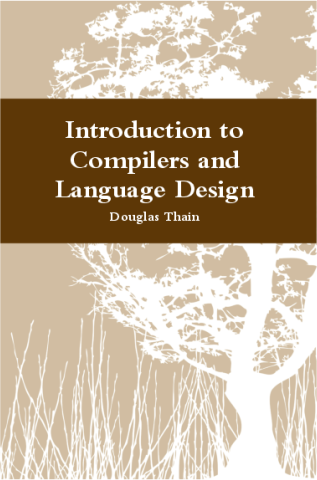 I am happy to announce that the first edition of "Introduction to Compilers and Language Design" is now available at http://compilerbook.org. This is a free online textbook: you can access the PDFs directly, or order an inexpensive hardcover book. Thank you to all the students who previewed this book and fixed typos and other errata. Thanks especially to Andrew Litteken, who drafted and tested the chapter on ARM assembly. I first estimated the book would be finished in 2017, but it took another semester to finalize several chapters, while also teaching a different class! Finally, I should mention that I was inspired by Andrea and Remzi Arpaci-Dusseau, who set a fine example by publishing Operating Systems in Three Easy Pieces as a free online textbook. It is a real pleasure to see all of these young men and women dressed up so nicely. As you may know, I spent a semester with all of the CSE students here as juniors in operating systems, compilers, and some other classes as well. It was rather early in the morning, and so as often as not, they were dressed in pajamas, flip-flops, and sometimes sweaty gym clothes. It is lovely to see everyone at their best. I invite you all to just relax for a little while, look around you, and take in this moment. Reflect a bit on the path that led you here. I'm sure that for most of you, it seems like you just arrived! Perhaps you took a long road trip to South Bend, and unloaded the car on a sweaty August afternoon. You met your roommate and probably wondered about their peculiar taste in music or food. You found your way around campus, met some interesting professors, did a lot of homework, and probably slept through a lecture once in a while. I'm sure every one of you has had moments of triumph, and some of tears as well. I hope that you made some lifelong friends, and maybe found romance along the way as well. What is free will, and do humans really have it? Are we redeemed by our faith, by works, or by the grace of God? What is the meaning of "segmentation fault"? Why does "git pull" default to merging instead of rebasing? As pleasant as it is to look back upon the college years, I am here to tell you that this is not the end, but only the beginning. The world needs your talents, and you have a lot of important work ahead of you. The modern world needs engineers, and our moment in time particularly needs Catholic engineers. To that end, I would like to offer a little reflection on the personal motto of Bishop Rhoades, which is "Veritatem in Caritate" or "Truth in Charity" This is an excellent motto for an engineer to keep in mind. Truth in Charity: You cannot speak the truth effectively unless you speak with charity. Likewise, it makes no sense to speak with charity if what you say is not the truth. First, truth. Our society is currently undergoing a loss of confidence in the idea of truth itself. Senator Daniel Patrick Moynihan once said, "Everyone is entitled to their own opinion, but not their own facts." and this was often repeated as a sensible guideline for political debate. Today, we are finding it more and more difficult to agree on the basic facts of a situation. And there is no point debating our opinions without first having facts: What was the high temperature today? Which car is more fuel efficient? How many people in Indiana are unemployed? The wonder of the Internet is that it has enabled everyone access to the world's knowledge, and allowed everyone to have a voice, which is empowering. But it has become harder for the average person to distinguish between trustworthy information and outright fabrications. I just took a look at the fact-checking site snopes.com, which felt it was necessary to debunk the myth that it is common for ostriches to go downhill skiing in Japan! But an engineer deals with physical reality and knows that the truth exists, whether we like it or not. Nature cannot be cheated. A drone that runs out of battery will fall out of the sky. A program with a race condition will lock up. A circuit that draws too much power will catch fire. An engineer's job is to stand up for the truth -- however inconvenient it may be -- because they know that Nature will come to settle the account sooner or later. Second, charity. It's no secret that our society is short on charity, which is a concern for the well-being of our neighbors. You all know the headlines about things like subprime mortgages, cheating on emissions tests, and the sale of personal data. In these and many more cases, clever people used their talents to benefit themselves while exacting a price not just against their immediate victims, but on society as a whole. Volkswagen might be able to pay back car owners who were defrauded, but there is nothing it can do to extract the excess pollution from the atmosphere. As engineers, you will build the machines that make society operate. In the twentieth century, that meant things like locomotives and roads and bridges. In the twenty-first century, it includes search engines, voting machines, and self-driving cars. In every single one of these cases, yes, there is a customer to satisfy, but society at large a greater interest to be protected. Some of you may work on self-driving cars, which have the potential to reduce crashes and save time and money. But when a self-driving car has a flaw that threatens pedestrians, who will speak the truth in charity? You will! Some of you may work on artificial intelligence, which enables us to find hidden patterns in massive datasets. But when a neural network perpetuates racism because of its poorly chosen training data, who will speak the truth in charity? You will! Some of you may work on systems for digital voting, which can make it easier for every citizen to participate in the political process. But when a voting system with a security flaw puts our democracy at risk, who will speak the truth in charity? You will! Now, perhaps that is all a bit heavy for this moment. It's a beautiful (rainy) spring day, you have worked hard to be here, and it's time to celebrate. So, let me instead give you one piece of advice that is more immediate. You can put it into use today! It is all too easy to get attached to our phones, our computers, our gadgets, and get sucked into the endless chatter of status updates, news items, upvotes, comments, and so forth. These constant distractions can prevent us from having deeper experiences with other people, and draw us away from truth and charity. Take time every day to turn off your gadgets. Enjoy a meal without looking at your phone. Spend an evening without the TV. Take a walk without looking at your watch. Trust me, your friends, your spouse, your children, and your parents will be much happier with your full attention. You can start at dinner with your family tonight: whoever picks up their phone first during dinner pays the bilk! It has been a pleasure to have you here at Notre Dame. Profs. Brockman and Thain are currently recruiting multiple undergraduate students to participate in a spring project at the intersection of compilers and computer architecture. The objective is to build a software toolchain (compiler, assembler, simulator, documentation, etc) that will allow programs written in C-minor to be compiled to the albaCore computer architecture. This package will be used in future offerings of logic design to assist students in running real, complex programs on custom FPGA hardware. Juniors or seniors who have taken either compilers or architecture (or both) are invited to apply by contacting either Prof. Thain (dthain@nd.edu) or Brockman (jbb@nd.edu). The project will be offered as a three-credit undergraduate research class in Spring 2018. 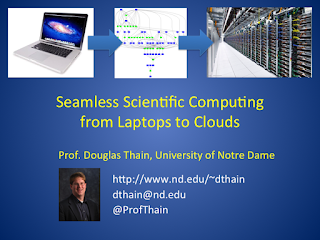 Prof. Thain gave the opening talk, "Seamless Scientific Computing from Laptops to Clouds", at the ScienceCloud workshop preceding High Performance Distributed Computing 2017 in Washington, DC. This talk gives an overview of the problem of migrating scientific codes from the comfortable environment of a laptop to the complex environment of a cluster or a cloud, highlighting our new tools for software deployment and resource management for bioinformatics and high energy physics applications. We are happy to announce the pilot of a new online short course in Data Intensive Scientific Computing. This is the equivalent of a one-credit seminar which provides an introduction to the challenges of scientific computing at large scale and the tools used to address those problems. The course was designed to augment our summer REU program in DISC, but is also suitable for undergraduate students taking research credits, and for graduating students in all disciplines looking for an introduction to topics and tools in scientific computing. By default, the online course is ungraded: anyone is welcome to sign up, view the lectures, take the quizzes, and follow the tutorials. If you want to receive a grade, talk to a faculty member at your institution to see if they will work with you on the material. 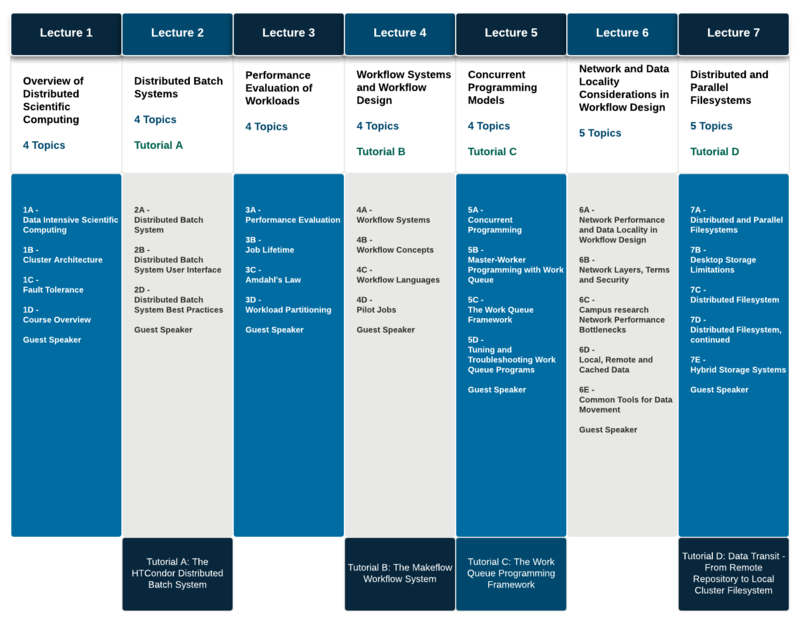 The course is developed by Prof. Douglas Thain and Prof. Paul Brenner, produced by the Office of Digital Learning at the University of Notre Dame, and offered through the EdX Edge platform. To my surprise, I am in the final steps of writing a textbook! You can see a sample chapter today at compilerbook.org. The effort began in the fall of 2016, as I was putting together my materials for CSE 40243, our undergraduate class in Compilers and Language Design. This class focuses on the challenges of engineering a working language: students implement a working compiler that translates a C-like language into X86 assembly. While there are a variety of solid textbooks that are great for a graduate course in compiler theory and optimization, none quite had the flavor I was looking for. Nearly every CS grad needs to write a parser, evaluator, or translator for some kind of little language in their career, but relatively few need to dig deeply into assembly language optimization. So, I wanted to focus on language design choices and show that simple languages are not hard to implement. I began to combine my handwritten chalkboard notes and some sample code into a LaTeX document, and the next thing you know, I have seven chapters written. I expect to finalize everything in the spring 2017 semester. 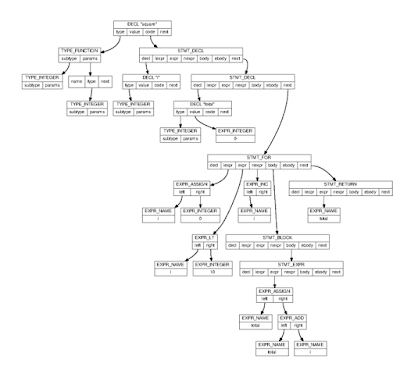 What has made it relatively easy so far is that my compiler automatically generates many of the figures and code examples automatically, so relatively few things have to be drawn by hand. 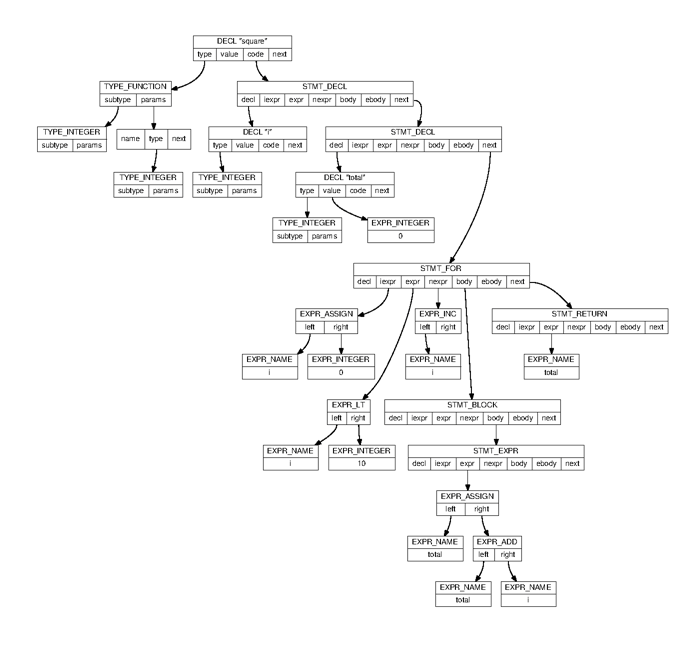 For example, this sample AST is produced automatically by the compiler emitting Graphviz DOT code from the internal representation. Neat, eh? Following the example of Remzi and Andrea Arpaci-Dusseau with OSTEP the book will be made available for free online in PDF form, and also in an inexpensive hardcover edition printed on-demand. 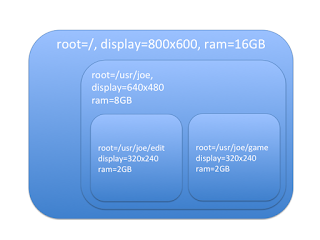 This semester, I am organizing an experimental class around the design of an operating system kernel. Six students formed a team in response to a call for volunteers, and now busy designing NunyaOS, an experimental OS kernel. Building on top of the Basekernel, they have built a system that boots an X86 machine, reads a CD-ROM filesystem, runs multiple processes in paged virtual memory, and has a simple windowing system. We are off too a good start. The key organizing principle of NunyaOS is hierarchical containment. This means that each process lives within a security container. Within that container, the process has complete authority to manipulate its resources. It also has the power to create sub-containers and then place child processes within them. 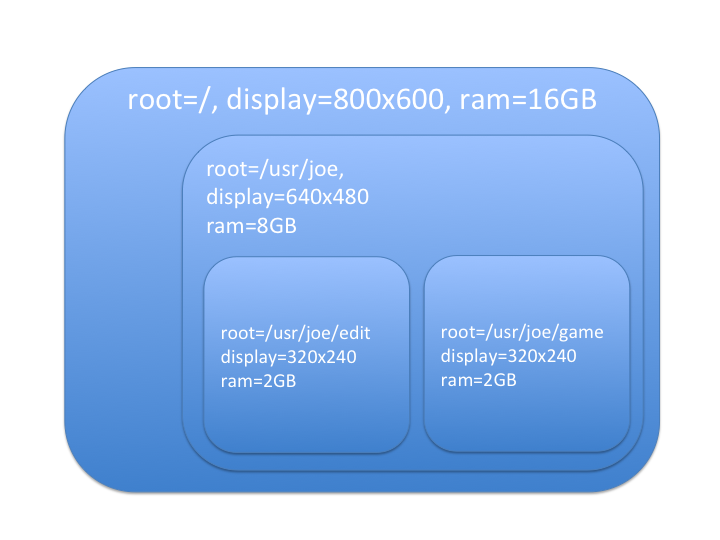 The containment can be applied to each of the resources within the system -- currently the filesystem, the window system, and the memory allocator. As a result, each process lives a in a sort of a lightweight virtual machine, where it perceives itself to be the superuser. Ideally, every child process will live in a container, so that we can eliminate attack vectors between code provided from different sources. For example, your desktop should run your web browser in a container, your web browser should run each tab in a container, and each tab should run downloaded code (like a video codec) in yet another container. In this way, untrusted code has very little leeway to affect other elements of your system. Of course, this idea changes the customs by which processes interact with each other. We can no longer build programs that scatter data all over the filesystem, and expect others to read it. There are many challenges here, and we have only begun to dig into them.